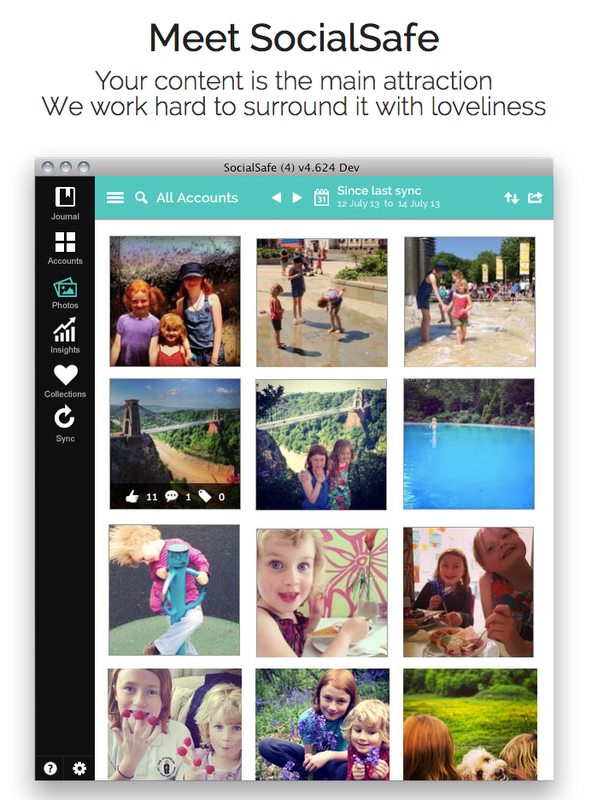 Save and Search Your Social Postings With SocialSafe | Brand On! If you are on a bunch of social media networks, you probably never thought about actually backing up all that information. And what if you want to search across various networks for that nugget of wisdom one of your connections shared awhile back? Fuggedaboudit…unless you are using Social Safe. SocialSafe is an app that you download to your PC or Mac and then connect directly to your social media accounts. All your data is downloaded privately to your computer. We’re talking Facebook, LinkedIn, Twitter, Google+, Instagram and Pinterest—plus a few others. SocialSafe lets you download everything from your social accounts and store it in on your computer. From there, you can copy photos or posts, or export your Facebook photos to a Dropbox folder. Another neat feature is a built-in journal that gives you a way to easily look back over events across multiple networks.